"Perhaps the major factor in survival is the individual's will to survive. Some die during capture, others survive horrible situations. 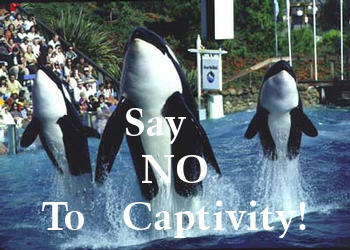 Humans can not judge which ones will make it, but we MUST judge if captivity is justified at all". 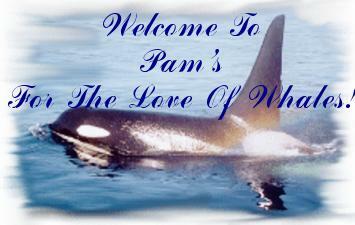 WELCOME TO PAM'S -- FOR THE LOVE OF WHALES! By contrast I have met scores of animal rights activists all with many stories to tell whose notes painting compelling portraits of their subjects rich emotional lives, yet whose conclusions frequently appear as fancy footwork around the obvious. It is possible, if one looks beyond the face, to read the emotions of dolphins and whales as easiliy and as accurately as one reads the emotions and feelings of other human beings. There are few feelings that dolphins or whales do not share with us, except perhaps self hatred. They certainly experience and express exuberance, joy, guilt, remorse, disdain, disbelief, awe, sadness, wonder, tenderness, loyalty, anger, distrust and love. Field studies show that most lay people have always believed: that dolphins and whales love and suffer, cry and laugh, their hearts rise up in anticipation and face in despair. They are lonely, in love, disappointed, are curious, they look back with nostalgia and anticipate furture happiness. The display of marine mammals for commercial gain does not represent values we should be passing on to the future generations. For there is a deeper, ethcial issue involved. By what RIGHT we do, we presume to deprive theses creatures of their freedom and slave them into performing circus tricks for our amusement. We owe these magnificant beings, the right of way in their own domain. My website started out being small and has since grown! When I first started this website, it was mainly opposing captivity. Since then, I've educated myself beyond the captive issue, as well as whaling issues and the mistreatment and abuse of these magnificant creatures. So, my pages are just a little about everything "whaley"! I hope what you read here makes you SAD .. then .. MAD Enough to act! Please STOP Buying The Tickets! I hope in some way my pages help to bring awareness to the captivity and whaling issues. This problem lies in US, as humans, TO understand, TO correct a great wrong that has been done ! Peace To The Whales And Dolphins !